Engineering and Products | Sakaiya Co., Ltd.
Screen printing is a type of stencil printing. Printing screens are made of chemical fiber or metal mesh, and the weave patterns work as holes for ink to be pushed out. Heat press forming is a type of plastic forming. Arbitrary shape can be formed by applying pressure on a plastic film or sheet by a set of molds after softening the material with heat. Hot stamping is a type of dry printing without using ink. Graphic will be transferred to an object by pressing heated and pressured foil of vapor-deposited metal against it. Nano imprinting is a microfabrication technology which transfers fine patterns imprinted on a die to materials such as plastic films or sheets and glass by pressing the die against the materials. Multi cavity forming is a type of plastic forming. Arbitrary shape can be formed by appressing a plastic film or sheet against a mold by pressure after softening the material with heat. Injection molding is a type of plastic molding which produces molded articles by loading heat-melted resin into a mold and solidifying the resin with cooling or heating. Sakaiya mainly uses thermoplastic resin. PSI molding is a molding method which combines a decorated plastic film or sheet with a molded article by inserting the material into an injection mold. Sakaiya invented this method in 1987. Plastic plating is a type of surface finishing which covers the surface of a plastic part with a thin metallic layer. There are wet plating which uses liquid for processing and dry plating which does not require liquid. Plastic plating means wet plating in a narrow sense. Spray painting is a type of decorative method which applies paint to an object. Other than decoration, this method is aimed at increasing the object's surface hardness and adding protective functions such as weather resistance. Graphics can be expressed by laser etching. All domestic locations have obtained ISO9001 and ISO14001. 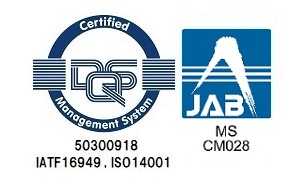 Overseas locations have obtained ISO9001 or ISO/TS16949. through continuous improvement of our management system. Sakaiya is always recruiting new members for various sections. For more details, feel free to Contact Us. Copyright © 2017 SAKAIYA Co.,Ltd. All Rights Reserved.